Check back next Thursday to see our picks for Week 7, and how the players performed that we picked the week prior. See the bottom of this article for details. Bollig (5-11, 185) is part of an Aquinas defense that is giving up 18 points per game. While that might not be an eye-popping statistic, consider the Saints play in the best league in the state. The Saints’ lone loss of the season came 27-14 to 4A-I No. 1 Bishop Miege, which averages nearly 43 points per game. Bollig, a senior linebacker, has been solid in registering 30.5 tackles including a season high 8.5 stops against Miege. Bollig has also collecting 3.5 sacks, six tackles for loss, and an interception. St. Thomas Aquinas will need another strong defensive performance this week as the second-ranked Saints host unbeaten and fourth-ranked St. James Academy. Two of Class 2-1A’s top receivers will go head-to-head in Friday’s showdown between Sedgwick and Medicine Lodge. This season, Francis, a returning All-2-1A pick, has racked up 30 catches for 591 yards and 10 touchdowns. Medicine Lodge’s Drew Honas has been just as good if not better with 27 catches for 671 yards and 6 TDs. Expect both teams to fill the air and Francis to get up for the showdown. Last year against the Indians, Francis had just 5 catches for 97 yards, but found the end zone three times on his way to 15 TD grabs – one of several school records the senior already holds. Hardin has passed for 1,411 yards and 16 touchdowns over the first five weeks of the season for the Knights. He has also rushed for 441 more on the year with three scores. His last three outings he has thrown for 300 plus yards and had four passing touchdowns in each of those games. Trinity Academy gets Belle Plaine this week and Hardin should have another big night. The Dragons are the only 11-man team in the state that has given up more than 300 points thus far this season. Belle Plain has given up 313 points or 62.6 per game. Sophomore linebacker Kaden Kraus has been a leader for the Dragons defense, posting 80 tackles through five games. Those 80 tackles include 28 solo tackles and three tackles for loss. In addition, Kraus has forced two fumbles. Expect the Dragons to rely on Kraus often as they face undefeated Pratt this week. 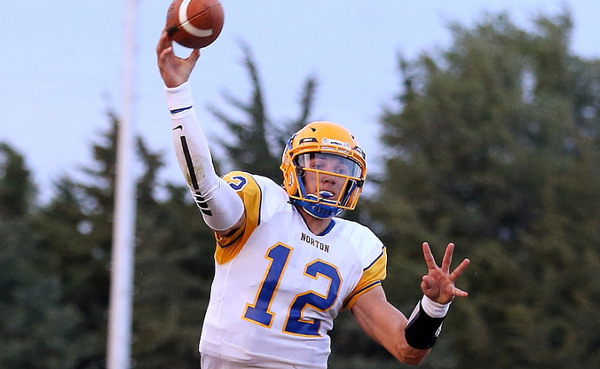 Miller is one of the top eight-man quarterbacks in the state. The senior has passed for 456 yards and nine touchdowns this season, and added 556 yards rushing and 12 more scores. He is coming off of a season where he rushed for 1,240 yards and 29 touchdowns and passed for 1,033 yards and 18 scores. Miller and the Patriots have a key district showdown with unbeaten St. Paul this week. Last season, St. Paul beat West Elk 66-42 and both teams advanced to the playoffs after a three-way tie atop the district standings with Sedan. Miller passed for nearly 250 yards and three touchdowns while adding 112 yards and two scores in last year’s meeting. For his career, Miller has rushed for 3,378 yards and 74 touchdowns, while passing for 1,856 yards and 35 scores. Schule is a multi-year starter at linebacker for Clearwater and he is coming through with his biggest season yet for the Indians in his senior season. Schule has already racked up 76 tackles for an average of 15.2 per game, including five tackles for loss and three sacks. Clearwater will be up against a high-powered offense this week in Chaparral and defensive stops will be crucial, so expect Schule to come up with another high-volume tackle game. Norton has been ranked in Class 3A for most of Jace Ruder’s career. This season, the 4-1 Bluejays have not been ranked in a deep Class 3A. However, Ruder, a four-year starter and North Carolina commit, has enjoyed his best statistical season. Norton has quality wins versus Goodland (37-34) and Plainville (40-10) and a road loss versus rival Smith Center, 43-0. Norton was only outgained 346-222 in the loss but finished minus-3 in turnover margin. A three-sport standout, Ruder has showcased his speed in the running game with 63 carries for 509 yards and eight touchdowns. He and senior Tevin Petrie (95 carries, 683 yards, nine scores) have handled virtually all of Norton’s ground game. Ruder has completed 53 of 94 passes for 635 yards with a 7/3 TD/INT ratio. He has a 39/21 career TD/INT ratio and 30 rushing scores. Ruder has delivered an 88.7 quarterback rating and 56 percent completion, both the highest since his freshman year. His 8.1 yards per carry and 102 rushing yards a game are by far the best in his four year. Norton averaged 34.4 points a game in ’16 and is at 36.8 this season. Ruder has benefited from a solid wide receiver corps that includes sophomore Kade Melvin, junior Hayden Wiltfong and senior Ryan Johnson. The trio has 38 grabs after little time in ’16. Ruder’s brother, freshman Jonah, has three catches in a reserve role. This week, the Bluejays play host to 4-1 Colby and junior standout Jordan Schippers. Colby had its best start since 1992 before falling to Holcomb last week. Norton won 52-41 last fall. Expect the game to again be close and high-scoring. Schurr had a huge night for the Bulldogs last week in their 58-40 district win against Solomon rushing for 465 yards and seven touchdowns on 49 carries. With Friday’s performance, Schurr improved his season total to 807 yards rushing and 14 scores to follow-up a 1,788 yard, 31 TD season a year ago. Playing in one of the toughest districts in Kansas, every game is key, and Friday is no exception as the Bulldogs travel to play a quality Logan-Palco team in Palco. If the Bulldogs are going to win another shootout over the Trojans - Osborne won 84-44 last year - Schurr should be counted on to carry the load early and often.